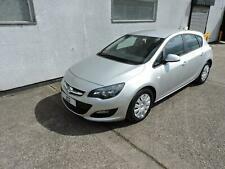 VAUXHALL ASTRA 2.0 SRI CDTI SPORTS TOURER. PARKED CLOSE TO A FIRE ON N/S. STOP START SYSTEM. FANTASTIC CONDITION,CLEAN INSIDE AND OUT. [PLEASURE TO DRIVE] 20.04.19. VERY LOW MILEAGE ONLY DONE 40.000. KJ AUTOS MIRFIELD - Call us on 441484508473 or click here to find out more. 15 VAUXHALL ASTRA SRI LTD EDITION 1.4 TURBO Salvage / Damaged Repairable. CAT S! 37K Miles * 19" Alloys * Body KIT * Clean Car! Up for sale is my 2015 vauxhall astra GTC. the car has only 38000 miles on the clock. It is white with black alloys which have no kerb marks on and 4 good tyres. It has one previous owner and ive had it 3 years. For sale is this lovely low mileage 2006 06 Vauxhall Astra Design twinsport. This Astra is in excellent condition for its age, small scuff to the rear bumper which can be seen in the photos but other than this the car is very tidy inside and out. JJ motors - Call us on 441773303834 or click here to find out more. Ashford Panelcraft - Visit us for a test drive - Call us on 441233224229 or click here to find out more. Fuel consumption (combined)72.4 mpg. Fuel consumption (extra urban)78.5 mpg. Fuel consumption (urban)61.4 mpg. Quick sale wanted. North East’s largest salvage operators. 6 months warranty, 5 day drive away insurance, we will provide full year MOT, Good bodywork, Black Cloth interior - Good Condition, Tyre condition Good, 5 seats, Silver, Air-Conditioning, 3x3 point rear seat belts, Airbags, CD Player, Central locking, Child locks & Isofix system, Electric door mirrors, Electric windows, Folding rear seats, Height adjustable drivers seat, Immobiliser, Remote central locking,. Unique Cars Thorntons Ltd - Call us on 441274028313 or click here to find out more. Original Vauxhall Floormats. Reistered V car. Car is in Immaculate Condition inside & out. Bluetooth Connectivity. 2011 VAUXHALL ASTRA 2.0 SRI VX LINE CDTI (AUTOMATIC). 2011 VAUXHALL ASTRA SRI CDTI VX LINE, 2.0, DIESEL, AUTOMATIC, BLACK, SRI BODY KIT, SRI SPORTS ALLOY WHEELS, SPORTS SEATS, AUX, CD PLAYER, MOT, SERVICE HISTORY, EXCELLENT CONDITION, DRIVES PERFECT. Vauxhall Astra SRI Front&Rear parking Sensors. 1.6 Petrol/Full service history/Very low mileage (49.500) /2 previous owner/Fresh one year Mot/Previous cat S. Very good tyres All around Vehicle look and drive like new! 2008 Vauxhall Astra 1.8 petrol automatic. 12 months MOT. New thermostat and front brake pads. Drives faultless. Buckingham and Stanley Ltd - Please call Helen or Kevin on 01223 841616 or email kevin.green@buckinghamstanley.co.uk - Call us on 441223930399 or click here to find out more. VAUXHALL ASTRA GTC STPORT. 12 Months MOT. (Will Put 12 Months MOT). LOW MILEAGE. Low Millage. A Superb car and great on fuel. Very Well Maintained. Great performance hatchback. FULL SERVICE HISTORY,ONLY 30K MILES!! Vauxhall Astra 1.4 SRI Turbo Petrol. MOT until April 2020. 48,000 miles on the clock. 2005 05 Vauxhall Astra 1.6i 16v Breeze 42,000 miles 1 owner . Richard Tucker cars - Visit us for a test drive - Call us on 441454800287 or click here to find out more. Available Car Leeds - Call us on 448081646857 or click here to find out more. HERE I HAVE MY VAUXHALL ASTRA 1.6 SRI AUTO. SEATS ARE AS NEW FULL V5 HERE MOT DONE 15/4/2019 BRAKES DISCS AND PADS DONE HAD A NEW COIL SPRING AS I SAY CAR DRIVES 100% LOW MILES 37000. JUST HAD NEW FRONT TYER. AVAILABLE to drive-away TODAY. Call us NOW!